I ask this in an effort to get to know you all more. To make this feel like more of a community and less informal. I am asking you to share 1 or 2 or however many fears of yours you have. Because I feel that what we are afraid of can say a lot about us. Big or small it doesn’t matter. I will go first. One of my biggest fears I would have to say is the fear of failure. I’m afraid of failing what i’ve set out to do. Of failing myself and my family. It’s one of those closet fears that I try to keep hidden under the surface but it so often bubbles up to the surface and rears its ugly head. There’s not a lot to say about this fear but it’s a big one and I thought I would share it. Another fear of mine is of death. Not of myself necessarily but of my family. It’s hard to picture a world without them. They’ve been there my entire life (shocker right?) and trying to imagine what it would be like without is absolutely horrifying. Thats the type of thing that keeps me up at night. I understand death is a part of life but to be honest that really doesn’t make these thoughts any easier to bear. So yeah it scares me. Those are two of my fears. I chose two pretty serious ones but you don’t have to at all. You could talk about spiders or snakes or blood just to name a few. Just say a little bit about why. And yeah I am looking forward to seeing what you all have to say. Last time I asked you guys what your goals were and you all responded amazingly. So I cant wait to hear from you this time. 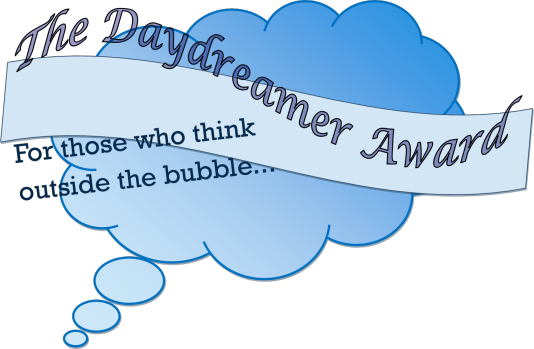 I was nominated for The Daydreamer Award! By my friend The Baffled Baboon (Go check him out!) He really enjoys my poetry and wanted to nominate me for this award as a result. That feels so awesome! Honestly it really does feel great to have your writing appreciated. So again thank you and make sure to check out his blog as well! My challenge is to write about the funniest thing that has ever happened to you! And the first thing comes to mind honestly is a recent experience I had at my clinical. I have my clinicals in a geriatric setting and I do a lot of LNA work there which consists of helping people change, going to the bathroom, eating, and cleaning themselves. A lot of fun stuff there! Recently I was providing perineal care (that means I was cleaning their private area) to a very elderly obese woman. It was my first time providing perineal care to anyone and I was a little nervous/uncomfortable. As I was cleaning down there the lady said to me “Don’t be afraid to be a little rough! You’re the first man to be down there in years!” and she started laughing hysterically. And I well I didn’t know how to respond haha. And now for my nominees/challenge! Your challenge: Write about the proudest moment of your life!